Welcome to Carpetball.org the the Official web page of the National Carpetball Association. The National Carpetball Association exists to support, promote, and encourage carpetball as a sport. 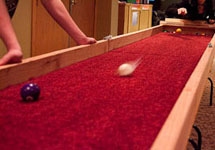 Carpetball is a popular camp game based on a 19th century parlor game. It was originally popularized in Midwestern youth camps in the late 1970's and early 1980's. While the rules for Carpetball are not hard and fast this web site gives a basis those wishing to get started in carpet ball.